In America, Alcoholic or 'Hard' Cider is one of the odder ducks in alcoholic beverages. In the UK and Ireland, drinking cider is a rite of passage during the warm summer months, served cold over ice at the pub or sipped lazily in the sun on a blanket in the park. But for Americans, Cider doesn't have similar rituals attached to it. 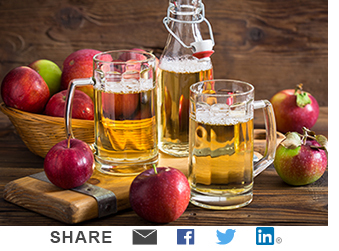 For most American consumers, Cider is something that is not quite beer and not quite an RTD, neither fish nor fowl. This has always lead Cider to be vulnerable to shifts in consumer preferences. Although Cider does get reflected shine from the Craft movement, we think that the novelty of recent innovation is wearing off and without British-style rituals attached to it, the emotional relationship with American drinkers is weak. That's certainly showing up in our numbers and we think this is a segment that is experiencing challenges. Cider's unique positioning is a tremendous asset when consumers are looking for novelty or flavor, but when the demand for flavored alternatives to regular beer dries up, cider moves backward quickly. We've seen that boom-bust many times in RTDs, flavored beers and other assorted experiments over the years and we are certainly in that bust cycle right now as it pertains to cider. When we dive into Beverage Marketing Corp's DrinkTell™ numbers, what first jumps out is the extraordinary boom from 2011 to 2015. Driven by the corporate focus around Sam Adams's Angry Orchard, Heineken USA's Strongbow and MillerCoors's Crispin, Cider rode a craft-inspired wave to new heights. Volumes jumped from 12.2 million gallons in 2011 to an astounding 67.3 million gallons in 2015 at an eye-popping annual growth rate of 53.4%. Sam Adams should get most of the credit for the mid-decade Cider renaissance. With their core beer brands showing signs of age and wear and tear, Sam Adams launched Angry Orchard in 2011. By 2013, Angry Orchard had taken control of the sector from long-time leader Woodchuck Hard Cider, a year after Woodchuck had been purchased by Irish multi-beverage company C&C Group for $305 million. While C&C watched helplessly, Angry Orchard quickly rose to just over half the market in 2014, a level of market share it has since maintained. The news gets even worse for Woodchuck as it wasn't just up against an angry Angry Orchard. The triad of Sam Adams, MillerCoors and Heineken USA quickly drove the long-time market leader from first to fourth, a stunning reversal of fortune. Woodchuck was 35% of the market in 2011 with Sam Adams, MillerCoors and Heineken's top brands collectively representing just 28%. By 2017, Woodchuck represented a paltry 5% of the market versus the collective 71% of the top three players. This is a truly stunning and possibly unprecedented turn of negative fortune. However, while the big players were racking up market share wins, by 2015 the consumer interest waned and the sector turned south and turned south quickly. Overall, Cider lost 7.5% of its volume in 2016 and followed the next year by losing another 7%. Collectively, the sector's 2017 volumes slipped well below its 2014 volumes with little positive news ahead outside of Rose flavored variants. So what does the rapid rise and now rapid decline of Cider mean to the broader alcoholic beverage market, beer especially? Our first instinct is put the recent failures of Cider in the historical context of other flavor-driven beer or beer alternatives which boomed and then failed. This list includes the first wave of Craft brews in the 1990s, the Malternative craze of the 2000s or products like alcoholic tea, lemonade or root beer, all of which shined, fizzled and then found a defendable floor of volume. But looking a little more deeply, we wonder if the consumer in this point in history is simply burned out on flavor choice in a declining Beer/Cider category. Since 2011, Beer/Cider per capita consumption stood at 20.4 gallons per head. Since then, per cap consumption has dipped 1% annually, now standing at 19.2 gallons. There's simply less demand for the product then there was seven years ago. Cider's troubles we think make it easier to worry about the long-term health of Craft. Within the broader beer segments, only Craft beer and Import beer saw material increases in per capita consumption from 2015 to 2017. Everything else — Light beer, FMBs, Cider, etc — was down during that period. So with gravity weighing on Beer as a category, the consumer seemingly tiring of flavor innovation and Imports in a forever growth mode, the last shoe to drop could be Craft. If that happens, Imports may be the last man standing in the short term — at least for growth.